I learned through 23andMe that I have a half-sister. However, my father was an identical twin, so this woman also matches with my cousin as a half-sister. Both twins are deceased. Is it possible to solve the mystery of which twin is actually her father? Probably not. If both twins were still alive, you might be able to figure it out. But it would still be quite difficult. Identical twins have, for the most part, identical DNA. Because of this, it is difficult to tell them apart by DNA. You’d need to look at each twin’s complete set of DNA (all 6 billion letters!) and see if there are any random differences between them. If you found any differences, then you could see which version the child inherited, and infer paternity from that. Without DNA from the twins themselves, this gets harder. But let’s dig into this a bit. How is it even possible at all? Identical twins start from the fertilized egg, made by a single egg and sperm. This egg divides a few times, and then splits into two parts. One group of cells becomes one twin, and the other clump of cells becomes the other twin. These identical twins start out with the same exact genetic information, since they started from the same egg and sperm. But the cells need to divide billions of times to make an entire person. And every time a cell divides, it needs to copy its DNA. Our cells are really good at copying DNA, but mistakes can happen. If a DNA letter is copied incorrectly, the new cell will have a mutation. All of us have a handful of mutations in some of our cells. For the most part, these don’t cause any problems. Many of these mutations won’t be passed on to kids. But mutations in sperm or egg cells would get passed on to a child. So the trick to telling apart the twins will be to find those rare mutations that the child shares with one twin, but not the other. The image below shows just one of these rare mutations being passed on to the child by the biological father (twin 1). Typically when there is a question of paternity, you take a specific test that compares 15 to 20 pieces of DNA between the potential father(s) and child. Check out this article to learn more about how paternity tests work. But given you’re looking for a few differences in billions of letters, it’s pretty unlikely a standard paternity test can distinguish between identical twins. A few years ago, this would have been the best you could do. But it’s possible now to read all the DNA in a person, in a fairly cost-effective way. We call this type of testing Whole Genome Sequencing (WGS). When you do this, in theory you should be able to identify small letter changes that exist in one twin but not the other. 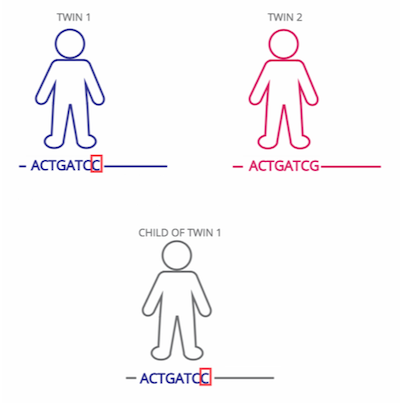 One research group used this kind of technique to study a pair of twins and a biological child to one of these twins. They were able to successfully identify the true father of the child.1 But it's still unclear how often this technique will be able to give a clear answer. More recently, some companies (like Veritas) are allowing their consumers to order this type of whole genome testing. But keep in mind genetic testing isn’t perfect – and sometimes reveals unexpected things. A lot of people are finding new relatives though services like 23andMe or AncestryDNA. They’re great at detecting relatedness, but you won’t be able to use them to distinguish between identical twins. These kinds of tests don’t look at all of your DNA. Instead, they look at less than a million specific spots. This is great for ancestry and general relatedness, but not good enough in this scenario. Worldwide 4 in 1000 people are identical twins. Given the increasing use of direct-to-consumer genetics that identify potential family members, these scenarios will become increasingly common. Hopefully this helps those in similar boat know how, in theory, they can distinguish paternity when there are identical twins involved. Weber-Lehmann et al. "Finding the needle in the haystack: differentiating “identical” twins in paternity testing and forensics by ultra-deep next generation sequencing." Krawczak et al. "Distinguishing genetically between the germlines of male monozygotic twins." PLoS genetics.